When you invest in a company it is not the product it's the CEO. The idea comes from the fact that the CEO affects the fate of a company and may be a big factor in whether or not people decide to invest in the company. 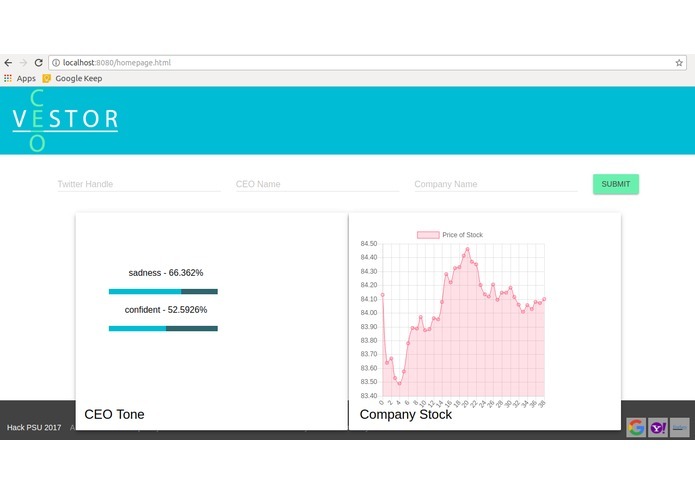 The website allows you enter in a CEO's Twitter handle, name, or company and perform a tone assessment based on their recent tweets to see their mood/personality traits and evaluate how they could affect the stock of the company. We use a Node.js server with APIs from Twitter and Robinhood to gather information and IBM Watson to assess tone. The main challenges involved making sense of how to use all of the different APIs. This was the first hackathon for many of our members. Many of our members were also not very experienced with Node.js so we all developed many new skills during the implementation of our project. Making use of many different APIs was something that took a lot of time and determination as well. We learned how to use many different APIs to make use of current technology as well as a more solid understanding of web servers. We would like to make use of more APIs to pull information rather than just having to get user input. We would like to not only do a tone assessment, but also a personality assessment using Watson Personality Insights. It would also be desirable to pull in news articles about different CEOs using Watson Discovery. We want this to be a hub for people to come to in order to make educated decisions about their investments. I worked on backend code and used the Robinhood API to gather stock prices for requested companies.